In Willetts’ January speech entitled Our Hi-Tech Future, he describes the strength of the UK research base and then explains how his policies link this to the wider economy in a bid to stimulate growth. The speech exemplifies the prevailing impact agenda for science – not only with a calculation based on number of citations, but also the importance of science to business. Here are the top 25 most common words from that speech, where you can see “business”, “economy” and “growth”. Meanwhile, over in France, Sarkozy is standing for re-election and the latest news is that he’s not doing so well. Ahead of Sunday’s election, Nature has published an interview with the president, who oversaw major changes to higher education and the model of science funding. Sarkozy told Nature that laboratory research funding is increasing (examination of this claim is beyond the scope of the current post!). In comparison to Willetts, Sarkozy is in optimistic election mode, with words such as “freedom” and “opportunities” appearing often. Here are the top 25 words from Sarkozy’s answers: as you’ll see, there is no mention of the economy or industry. “Research” is by far the most common word from both Willetts and Sarkozy. The key difference in their speeches has to be the fact that Willetts focuses science on its economic potential, while Sarkozy seems to talk more about scientific research as an imperative itself. The methodology of this brief analysis is far from watertight. Here are some limitations. One data source is a speech, the other an interview. Sarkozy is trying to win an election, Willetts has his seat already. “Investments” is one of Sarkozy’s key words only because it is included in the name of a policy programme. And, finally, the tool used to create the word clouds above is Wordle, which works in mysterious ways. Nevertheless, the word clouds produced are enlightening. Sarkozy image from World Economic Forum. Willetts image from BIS. 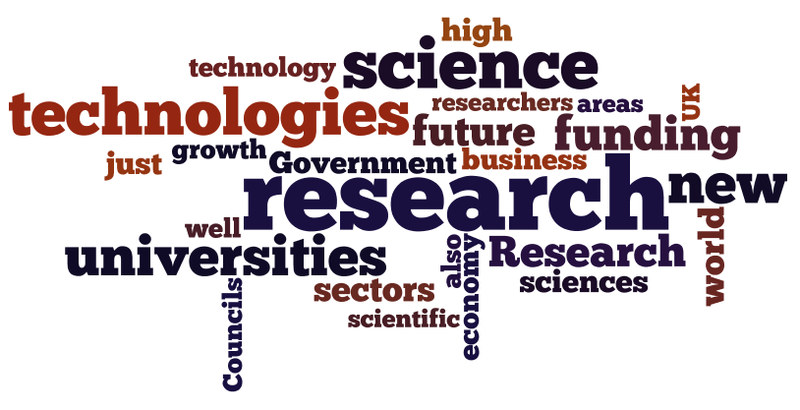 Not a very fair comparison as the words used in Sarkozy’s interview were clearly shaped by the questions asked by Nature, which were all about basic research, whilst the Willetts speech chosen is “Our High Tech Future”, not exactly a speech about basic research…. While I admit that we can’t draw a lot from this exercise, I think it’s still worthwhile to a limited degree. Although the Sarkozy source is an interview, you can usually trust politicians to answer questions which the message they want to communicate. This does not often stick to answering the question put to them. If Sarkozy wanted to shout about how much French science was working for business, he could have done so here. Moreover, by far the most common word for both texts was “research”, a link that justifies – invites? – some level of comparison.